October is Huguenot Month in Spitalfields and this year’s theme is Women & Power including walks exploring Spitalfields Sisters, The Work & Lives of Remarkable Women. 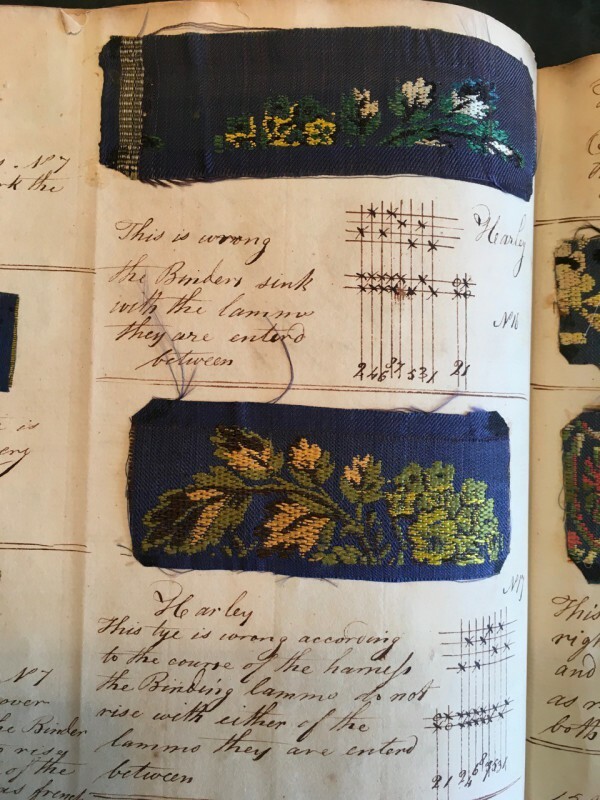 When my eyes fell upon the weaving ledger of Samuel Wilson (1792-1881) for the first time, I was struck not only by the captivating fabrics but also the beauty of the detailed records of production and manufacturing processes. Each line, carefully written in exquisite copper plate, sits alongside its own delicate textile production sample. Written between 1811 and 1825, the ledger is a record of Samuel Wilson’s apprenticeship to his brother’s company, Lea & Wilson of 26 Old Jewry, Cripplegate, alongside an account of his personal exploration of weaving processes. 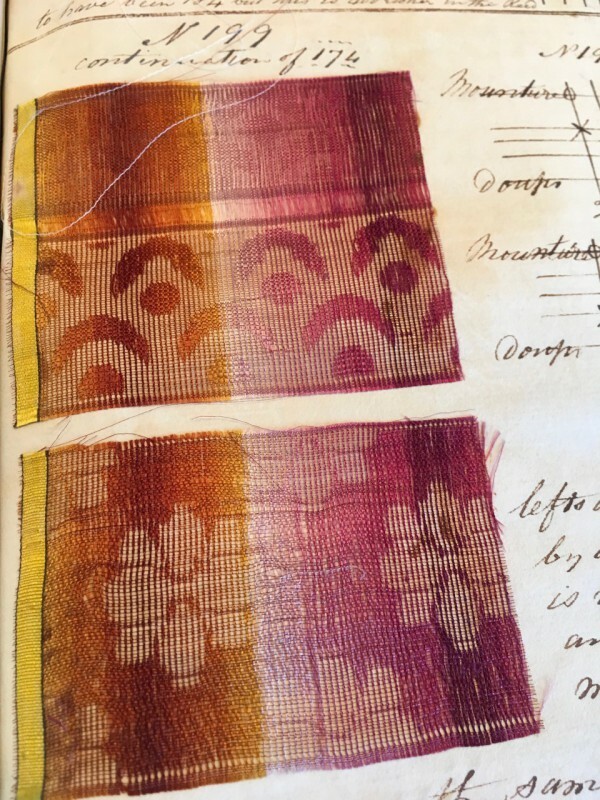 When he embarked on his apprenticeship in 1806, Samuel began a comprehensive study of the process of silk manufacture – from throwing to weaving. Samuel’s brother, Stephen Wilson was known for introducing an early version of the Jacquard loom into England in 1820 through his own patent. He was already well established within the London silk industry and had expanded his business with additional premises in Streatham. In the pages of the ledger, it is evident how mechanical improvements were contributing to the development of the Joseph Marie Jacquard’s new manufacturing technology. Samuel Wilson became a leading force in the London silk industry and worked his way up to the position of Upper Bailiff in the Worshipful Company of Weavers. By 1838, the power of Samuel’s Wilson wider influence was recognised when he was elected Lord Mayor of the City of London. 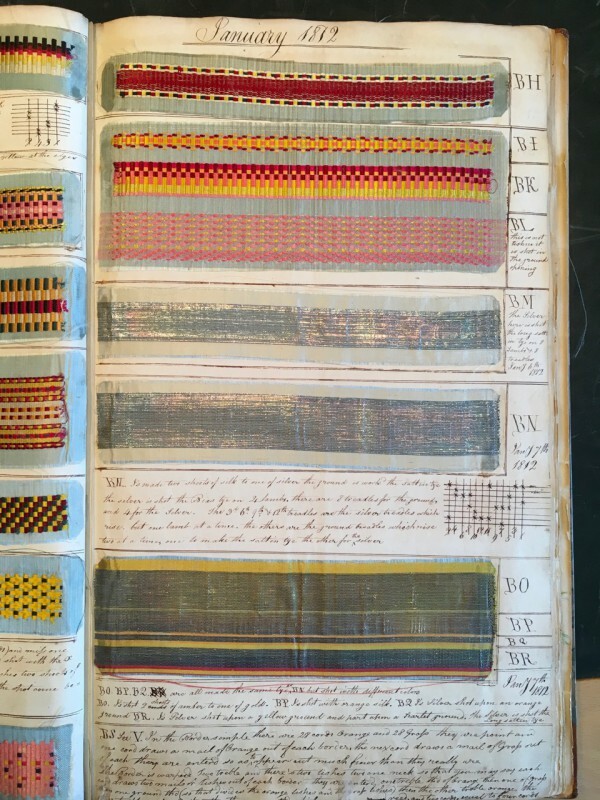 Although his ledger is in private hands, I have been granted the opportunity of studying it in detail after I first encountered while researching early nineteenth century looms with textile historian, Mary Schoeser. Turning the pages carefully, we were both surprised how the ledger touched us and, without quite realising it, we found we had made a silent pact to uncover the secrets held within. The opening pages are devoted to a discourse on how to create a perfect woven circle and the many minor adjustments to the ‘tyes’ and ‘sett’ that Samuel had to make on a loom to achieve this. It reveals the remarkable technological changes weavers experienced in the first three decades of the nineteenth century. Part-way, the ledger includes patterns for silk scarf designs. A tantalisingly small cutting of a hand-woven red and yellow silk for ‘chair bottoms for one of her majesty’s rooms in the Castle Windsor’ in 1816 is pinned carefully to the left-hand corner of a page. Samuel Wilson’s apprenticeship record is a rare discovery that offers a unique view of the workings of the London silk industry in his era. More importantly, Samuel shares his own experiments and personal findings alongside accounts of disputes over weavers’ pay, dye recipes and client orders. 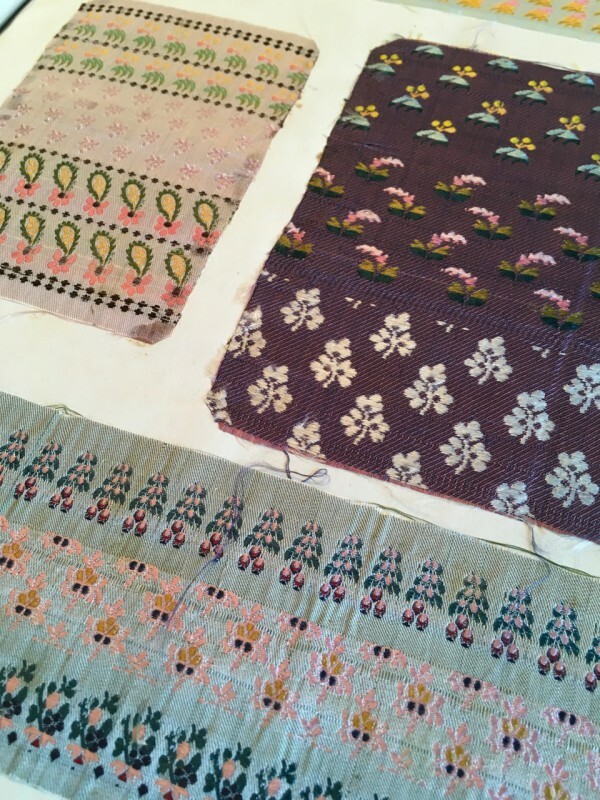 The fabric samples and text are of great interest in their own right, but together they comprise an exceptional window into the development of a period in London’s textile history that is largely neglected. Through his personal ledger, we can read Samuel Wilson’s personal thoughts and hear his voice too. These are lovely….works of art really.. I know of several similar pattern books done by people who are crocheting or knitting for themselves or their families. Little snippets of patterns. Also works of art.